Every time you skate, before you skate, check that the wheels aren’t going to fall off! Your wheels shouldn’t wobble side to side. If there is any play then tighten up the retaining nuts/bolts. 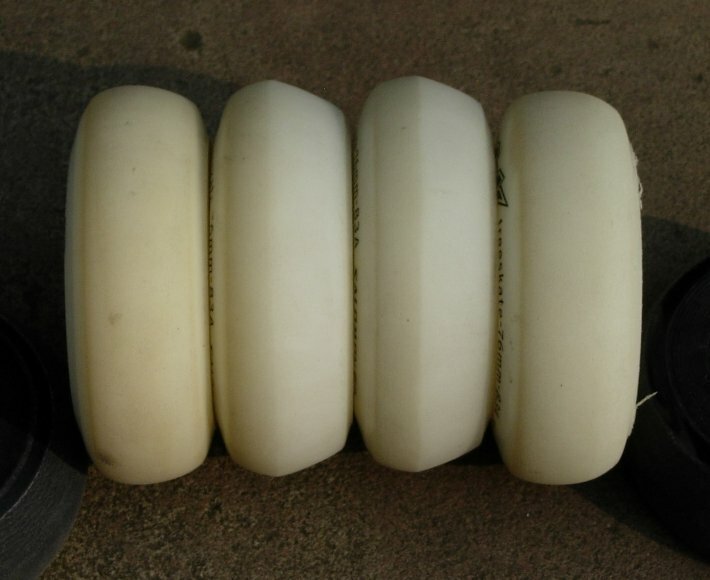 The frequency with which you will need to undertake other work on your skates obviously varies with how much you skate, your skating style and where you skate. Wheel wear is one to keep an eye on, particularly if you’re skating outside. 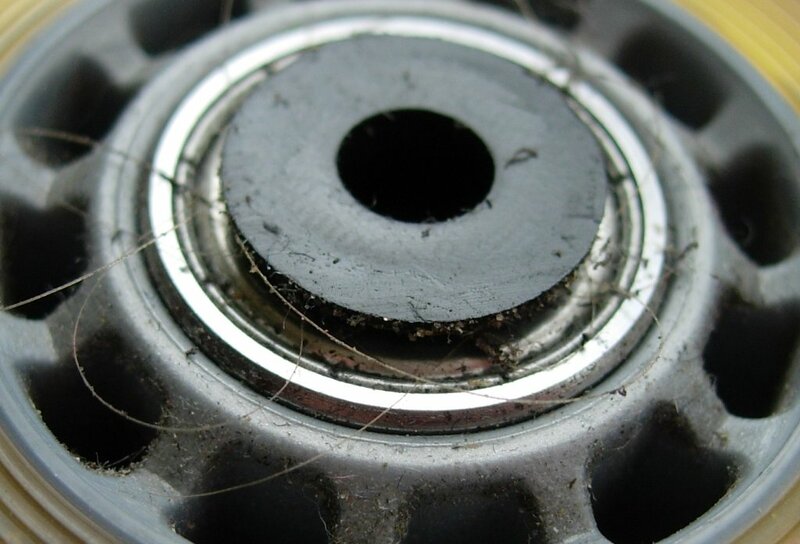 If you skate outdoors then you will need to switch your wheels regularly. This involves swapping the wheels between the left and right skate and moving them to a different position. This image shows how the inside edge gets worn resulting in an uneven profile. The middle two wheels in this picture are toe wheels. The normal pattern of wheel rotation is that the right toe wheel (wheel 1) becomes left wheel 3. Right 2 moves to left 4. The left skate mirrors this. Note that you don’t flip the wheels round! What was the inside edge on the right becomes the outside edge on the left. Bearings/spacers will need cleaning from time to time, more frequently if skating outside. As you can see from this image they pick up dirty and hairs. Removing the spacer allows hairs to be removed, use a clean dry cloth to wipe away the dust and other debris. Don’t use WD40! It strips the lubricate from the bearings. Less frequently you might want to strip clean the bearings.